The most important tourist city on the island of Lanzarote, in the Spanish Canary Islands, welcomes European tourists, endeared by the beach and hotels lining the beach. Clinging to the biodiversity of the Canary Islands, Lanzarote in particular, the town of Puerto del Carmen is a paradise for sportsmen and lovers of sun, beach and convenience, as this is its accommodation offer. Geographically, the location is ideal: situated south of the island, it is the best starting point for excursions to other places of the area: Puerto Calero, Costa Teguise, Santa Club, not to mention the Timanfaya National Park (where the lava is everywhere). The incredible landscapes owe their fame to the volcanic 1origin of the island; they have been well preserved by creating a national park, a marine reserve and a number of specially protected areas. The tourist vocation of Puerto del Carmen is expressed in hotels, restaurants and clubs located just a few hundred meters from the sea, following the path of the long beach that stretches for seven kilometers: it is the famous Avenida de las Playas. The city has also a casino and a golf resort. Those who want a more quiet and private atmosphere, can reach the old part of the city, enlivened by the ancient Puerto Tinosa. Even here there is movement, but everything is focused on the wonderful view that even bars and clubs enjoy, over the volcanic mountain of Papagayo. Animal lovers will appreciate the Rancho Texas Park, a sort of biopark which aims to preserve the environment and nature in harmony with animals. Those who love the sea in Lanzarote will also enjoy the view of its abyss: Puerto del Carmen has lots of places for diving. The water temperature is always maintained between 20 and 23 degrees. Perhaps not everyone knows that the island of Lanzarote that everyone admires today, a combination of nature and urbanization, owes its fortune, and its preserved beauty, to the artist Cesar Manrique, who wanted to blend nature and art in the uniqueness of the island , giving the residents a number of his works. 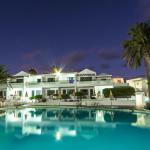 Bungalows Las Gaviotas lies opposite to the Matagorda beach, a short distance from Puerto del Carmen. 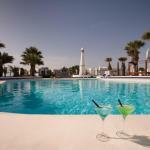 The complex boasts seven pools with bar and relaxing bungalows overlooking the sandy beach of Lanzarote.